With a unique split design, this impressive building can be used for a variety of purposes. 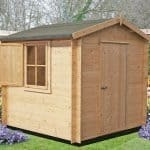 Made up of one larger and one smaller room, the log cabin features a dominant apex roof with a slight overhang to provide excellent weatherproof protection. This overhang ensures any rainwater will run off the roof without touching the front or sides of the building. 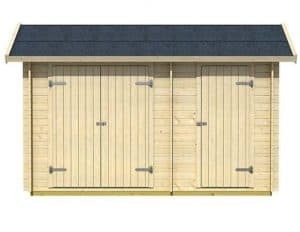 The apex feature also provides added interior height which is ideal if you find the majority of shed roofs to be too low down. 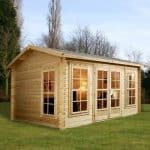 The interlocking timber also adds to its water resistance, while the windowless feature ensures you can use the building as a private hobby shed or storage space. Of course, this does mean there won’t be any natural lighting in the cabin. If you do plan on using it to work in, you will need to spend extra money on an electrical pack. This will not only provide lighting in the shed, but it also provides vital electricity that you will need to use power tools and other machinery. 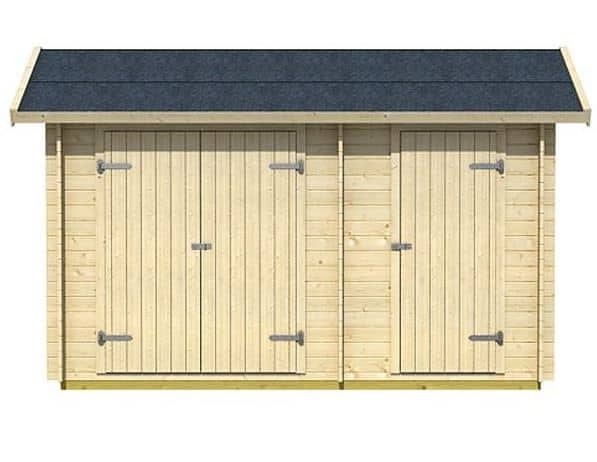 It also boasts a 3 door design and it benefits from a 10 year anti-rot warranty. 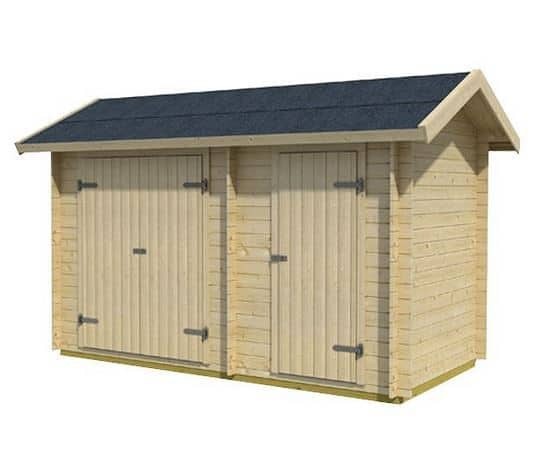 The warranty will only be provided if you treat the shed with a high quality preservative, but it’s still an excellent feature as you are guaranteed the building will last for many years. This is a luxury wooden log cabin with a unique split room construction. The traditional style apex roof has a unique overhang that further protects the building against water damage. This is because rainwater runs down the diagonal roof and doesn’t have chance to run onto the front or sides of the building. The overhang features around the entire width and depth of the cabin. One extra benefit of the apex roof is that it brings more internal height, enabling the storage of tall machinery and tools. The building has a tall design, with a roof height of 2.49m. The eaves are also taller than average, measuring 2.12m high. The overhang is also worth mentioning and it measures 0.30m. One of the things we like about the cabin is the fact that despite having so much interior space, it is impressively compact. It measures 3m wide and 4m in depth. So it should fit comfortably within medium size gardens. It isn’t unusual to see an outdoor building with tongue and groove cladding. 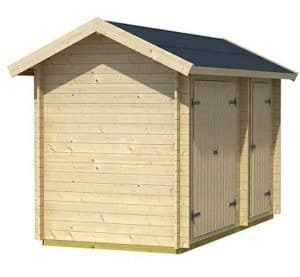 It’s actually the most common type of cladding used on storage sheds and cabins. However, what is unusual and what gives this building an edge over its competitors is the double tongue and groove cladding. Basically it comes with twice the thickness of standard tongue and groove, giving it an exceptionally strong, interlocking design. The cladding measures 28mm and another unique feature is the fact it is made with Pine. This not only ensures an excellent quality finish, but it also gives the cabin a cosy, attractive style. Tongue and groove cladding also gives the building support in case the Pine expands or warps due to moisture or heat. An expansion gap helps to accommodate the changes within the wood, ensuring it doesn’t cause problems for the structure of the building. Another positive benefit of this cladding style is that it is one of the easiest to install. The unique design of each panel means that it slots easily into place. Think of laminate flooring and you’ll get a good idea of the installation process involved. 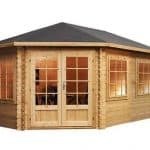 It isn’t just the outer part of the log cabin that offers such fantastic durability. The framing is also really thick and the floor also benefits from tongue and groove construction. This means it can easily hold the weight of heavy machinery. So both the inside and outside of the building has been designed with a high quality, stable and durable finish. There is no mention of the timber being treated prior to shipping. Therefore it is really important to ensure you treat it with a high quality preservative. This can be done either before you put it together or afterwards. Regular treatments are also one of the terms and conditions of the 10 year anti-rot warranty provided with the building. We always recommend the spirit based treatments as they help to protect the full structure of the timber, rather than just the outer part. Some also don’t need to be reapplied every year. So you could save both time and money by choosing this treatment option. As there are two separate rooms, the cabin comes with two different entry points. The larger room benefits from double doors measuring 1.50m wide and 1.79m tall. The smaller room then has a single door measuring 0.79m wide and 1.79m tall. We like the subtle variation in style with the doors. Whilst the main walls of the building come with the logs built horizontally on top of each other, the doors have a vertical design. They also come with attractive hinges that add character and style to the building. The fact the cabin doesn’t have windows could prove an issue if you are using it as a workshop. After all, there won’t be any natural lighting provided, so you’ll need to invest in an electrical kit which can be pretty pricey. We’re happy to say this is one of the most secure and private cabins we have reviewed. The double tongue and groove cladding is extraordinarily thick, acting as a great thief-deterrent. It also provides a lot more support for heavier storage, giving it a safer design. Being windowless it also gives you a great level of privacy. So we do recommend this building for anything of value that you need to store. There are no customisation choices available with this cabin. However, that definitely isn’t a bad thing. As the cost of the building is already pretty high, it helps to not have to pay for more customisation options. However, there are a couple of extras you might be interested in. The main extra on offer is the insulation kit. As the cabin is primarily designed as a workspace, one thing you will want to consider is how comfortable the building is. There are two insulation kits available, with one being thicker than the other. Now, the only downside to these kits is the cost. Even the thinnest insulation kit costs a massive £269. If you want the thickest kit then you’re looking at almost double that amount. So it certainly isn’t a cheap upgrade. However, not only will it keep you warmer in the winter months, but it will also help to further protect the building. Of course another expensive extra that could be a necessity is an electrical kit. After all, you can’t work if there isn’t any lighting or power for your tools! So it’s a little disappointing that the upgrades to this building are going to bump the cost up significantly. However, you need to factor in the long term value of any upgrades you do decide to make. We rate this shed highly in terms of quality. Not only do you benefit from standard water-resistant and theft deterrent features, but it also comes with a few excellent unique benefits too such as the roof overhang. The quality of the materials really can’t be faulted. It’s not surprising that this cabin has excellent longevity. Made from thick logs, the timber is really durable and capable of withstanding all weathers once it has been treated. It is also extremely resistant to daily wear and tear. We really love the fact this cabin comes with a split room construction. 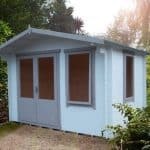 It enables you to either have two separate storage areas, or the larger area could be used as a workshop, with the smaller room used for storage. The capabilities are fantastic and offers a great amount of flexibility. The thickness of the logs used on the building also make it possible to hang internal shelving. This again increases its storage capacity. Make no mistake about it – this is a very heavy cabin to put together. You’re not just dealing with standard cladding here. The logs will require at least two people to put them together. However, we actually recommend using 3+ people. It will also take a long time to construct. Despite this, the instructions are easy to understand and everything does fit together really well. Due to the flexible storage capacity and the quality of the materials used during construction, we feel this cabin gives you incredible value for money. Final Thoughts: There’s a lot of things to like about this log cabin, with the main feature being its split room design. If you’re looking for a building that gives you flexibility in how it can be used, this is a great option. It is also built with incredibly thick, strong logs to ensure it lasts a substantial amount of time. Like most wooden buildings, it does require treatments and the extras you may need to invest in do increase the cost quite a lot. So before you buy you really do need to take these things into consideration. 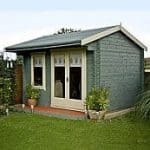 Overall though, even with the cost of these extras, the cabin provides exemplary value for money and will make a beautiful addition to the garden.